The Norwegian Doom machine offers heavy and viscid symphonies, which are not only massive and brutal, but also raw and coarse. The hypnotic drumming highlights the raw sounds and vocals, as well as the tuned-down guitars that produce one crushing riff after another, as if forged from the confines of inner conflict. Expect no lovely melodies or kitsch from SYRACH. 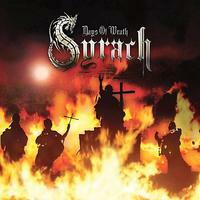 Days of Wrath delivers a violent and hopeless approach to the musical experience! Produced by Herbrand Larsen (Enslaved). 1. Are You Able to Breathe Fire?